Underground nuclear tests can be detected in the skies and as a result, global satellite networks could become a powerful tool in order to detect clandestine underground nuclear explosions (UNE). The scientists presented their findings at the American Geophysical Union conference. The International Monitoring System (IMS) was established by the Comprehensive Nuclear-Test-Ban Treaty and has seismic detectors for terrestrial shock waves, hydroacoustic networks that scan the ocean for sound waves, and radionuclide networks to detect radioactive particles produced by nuclear explosions. Jihye Park, a postdoctoral researcher at Ohio State University, and her colleagues think that the ionosphere could also help in detecting nuclear explosions. Every nuclear explosion sends up an electromagnetic pulse that ripples through the ionosphere. This traveling ionospheric disturbance (TID) should be detectable by the technologies sensitive to the changes in the ionosphere, like global satellite networks and radio telescopes. In fact, there have been proposals to leverage GPS in detonation detection since 1979. However, earthquakes and storms can also produce TIDs. So researchers need to be able to uniquely identify an underground nuclear explosion. In this study, the team analyzed signals that GPS stations received after two 20-kiloton UNE tests the USA conducted in 1992. These two tests were part of a series of 8 UNEs conducted from 1991 to 1992 at a Department of Energy reservation, 100 km northwest from Las Vegas, Nevada. 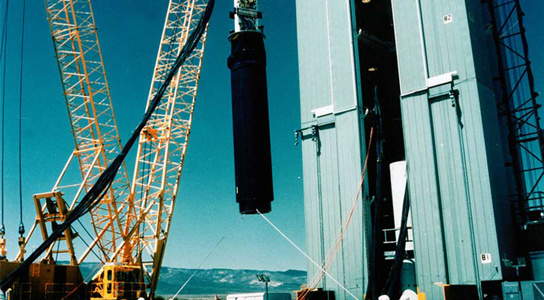 Researchers had been testing nuclear devices at the Nevada Test Site since 1951. These were the last tests the USA conducted before President George Bush signed a law imposing a moratorium on all nuclear weapons testing on October 2, 1992. The team developed an algorithm to find the signal within the noise detected by the GPS stations. The effect of distortions from changes to the diurnal cycle and from the changing geometry of the satellites themselves was removed. The ionospheric delay between the satellites and stations was converted into “total electron content” in the TIDs. This generated a unique profile for the TIDs. This same profile appeared in multiple stations, and allowed the team to pinpoint the original signal. The Very Large Array (VLA) of radio telescopes, near Socorro, New Mexico, used a similar algorithm to come up with a similar result. The advantage of using GPS detection is that the infrastructure is already in place and available globally at no cost. The team still needs to iron out some kinks before this method can become fully operational. Be the first to comment on "Satellites Could Be Used to Detect Nuclear Tests"